Mario A. Garcia, SR. 71, beloved husband of the late Consuelo, devoted father of Maria (Dennis) Chow, Mario, Jr. (Consuelo) and Monica (David) Bonifield; dearest grandfather of Jory, Jessilyn, Victoria, Valentina, Vanessa, Vivian, Ethan and Charlotte; dear brother of Yolanda, Lucy, Peter and the late Ricardo and late Luis. Visitation Friday, February 8, 2019 from 2 to 8:00 p.m. and Saturday, February 9, 8:30 a.m. till time of services at 9:30 a.m. at Ivins/Moravecek Funeral Home 80 E. Burlington St. Riverside to St. Mary Church Mass 10:00 a.m.
To send flowers or a remembrance gift to the family of Mario A. Garcia, SR, please visit our Tribute Store. 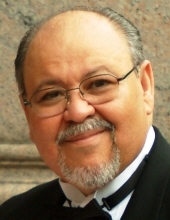 "Email Address" would like to share the life celebration of Mario A. Garcia, SR. Click on the "link" to go to share a favorite memory or leave a condolence message for the family.